SOUND FORGE Pro is the application of choice for a generation of creative and prolific artists, producers, and editors. Record audio quickly on a rock-solid platform, address sophisticated audio processing tasks with surgical precision, and render top-notch master files with ease. New features include one-touch recording, metering for the new critical standards, more repair and restoration tools, and exclusive round-trip interoperability with SpectraLayers Pro. Taken together, these enhancements make this edition of SOUND FORGE Pro the deepest and most advanced audio editing platform available. Record multichannel audio in ultra high quality. The redesigned recording dialog make for even more efficient workflows. Select from thousands of included samples and create unique sounds for your productions. Professional mastering and processing tools help you edit audio and video files with ease. SOUND FORGE comes with a holistic range of tools for sound design and editing. In addition to the classical set of recording features, the included tools deliver pristine quality in sound design, restoration and mastering use cases. Edit, convert and finalize in nearly every format with ease. And of course, every step can also be applied on objects. SOUND FORGE assists you from importing media to finishing your masterpiece. Create Red Book compatible DAO CD masterings and prepare your project for replication. The professional mastering tools by iZotope enable you to create both technical and creative masterings within SOUND FORGE. This makes it a true one stop solution for recording and editing audio. 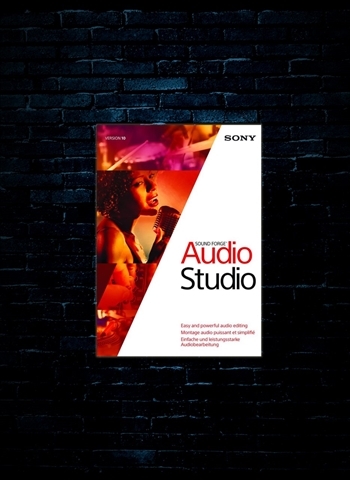 Record up to 32 simultaneous channels of 64-bit/192kHz audio for the ultimate in fidelity. In the mastering suite, select from among twelve included iZotope DSP modules and access superb mastering chain processing tools for sparkle and punch, excellent repair and restoration plug-ins, and precise format conversion tools for the best in sonic integrity preservation. SOUND FORGE Pro 11 has a brand new recording interface with features that make even the most demanding work a snap. From running punch-and-roll sessions to managing multiple takes, we have you covered. The editing experience that you expect from SOUND FORGE Pro just got even better. New in SOUND FORGE Pro 11: convert regions to events, lock event markers, region markers, and envelope points to events, and automatically ripple successive events forward in time while editing. SOUND FORGE Pro 11 includes a full complement of native signal and effects processing plug-ins, including our own popular Noise Reduction 2 audio restoration suite. Partner contributions from iZotope and Zplane make the latest edition of SOUND FORGE Pro an even more incredible one-stop solution for delivering master quality audio. Transfer audio data between SOUND FORGE Pro 11 and SpectraLayers Pro and experience the thrill of working freely across the world's premiere waveform and spectral editing applications. SOUND FORGE Pro 11 includes fully integrated DAO CD mastering to generate Red Book compliant masters for duplication. Additionally, perform PQ code editing, add CD text and metadata, and prepare high resolution audio tracks with iZotope resampling technology. SOUND FORGE Pro 11 software supports multiple video formats including AVI, WMV, MPEG-1 and MPEG-2. Precisely synchronize audio and video frame by frame. SOUND FORGE Pro 11 includes MPEG-2 templates for writing HDV-compliant files at both 720p and 1080i resolutions, and AVI templates using the CineForm CFHD codec for 720p and 1080i intermediate renders. Use SOUND FORGE Pro 11 software to export multichannel files in surround AC-3 format using the included Dolby Digital AC-3 plug-in. Operating Systems: Windows Vista, Windows 7, Windows 8, Windows 10.